The Geminid meteor shower occurs every year again in the period 12-15 December. It is one of the most consistent and prolific meteor shower of the year at a rate up to 120 shooting stars per hour. Once again, I did not have much time for hobbies but wanted to make a few QSO and keep especially the lookout for new stations. Highlight was Yuri – UT5EL/A who gave me a new locator on 2m with his # KO31lg. Yuri was running only 100w into a single Yagi. 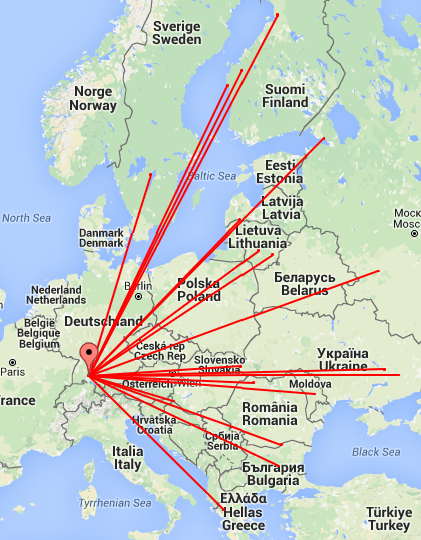 The distance of this QSO was 1333km and Yuri had a great patience what made this QSO possible – TNX Yuri ! ODX of my small Geminids activity has been OH9HEU with 2137km. So see below the log and a QSO map.